We have the new Akita JALT website. Please click here. 2. Insights on the job market, introductions --- JALT plugs you into a network of over 3000 language teaching professionals across Japan. 3. Twenty special interest groups and their newsletters: Bilingualism. Global Issues, College and University educators, CALL, JSL, Teaching Children, Materials Writers, Teacher Education, Testing, Gender Awareness, Pragmatics, Other Language Educators, Junior and Senior High School, Learner Development, Pragmatics and more. 4. JALT is a place to call your professional home. And with 40 Chapters across Japan, JALT is not far from your other home. 5. Monthly Chapter programs and regular regional conferences provide both valuable workshops and the chance to share ideas and hone your presentation skills. 6. Professional organizations look great on a resume. Volunteer for a Chapter position, work on a conference, or edit for the publications. You gain organizational and management skills in the process. 7. JALT maintains links with other important language teaching organizations, such as TESOL, IATEFL, AILA, and BAAL. We have also forged partnerships with our counterparts in Korea, Russia, Taiwan, and Thailand. 8. Research ready for publication? Submit it to the internationally indexed JALT Journal, the world's fourth largest language teaching research journal. 9. Looking for a regular source of teaching tips? Check out our celebrated magazine The Language Teacher and to the many fine publications produced by our SIGs. 10. JALT produces Asia's largest language teaching conference, with scores of publishers displaying the latest materials, hundreds of presentations by leading educators, and thousands of attendees. 11. 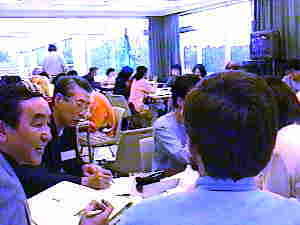 JALT nurtures a strong contingent of domestic speakers: Kensaku Yoshida, Marc Helgesen, Kenji Kitao, Chris Gallagher, Ritsuko Nakamura, David Paul, Andrew Barfield, Tim Murphey, David Martin, and many others. 12. Conducting a research project? Apply for one of JALT's research grants. JALT offers partial funding for one or two projects annually. 13. Free admission to monthly Chapter meetings, discounted conference fees, subscriptions to The Language Teacher and JALT Journal, discounted subscriptions to ELT Journal, EL Gazette, and other journals. All this for just \10,000 per year for individual membership, \8,500 for joint (two people), or \6,500 if you hustle and get up a group of four to join with you.